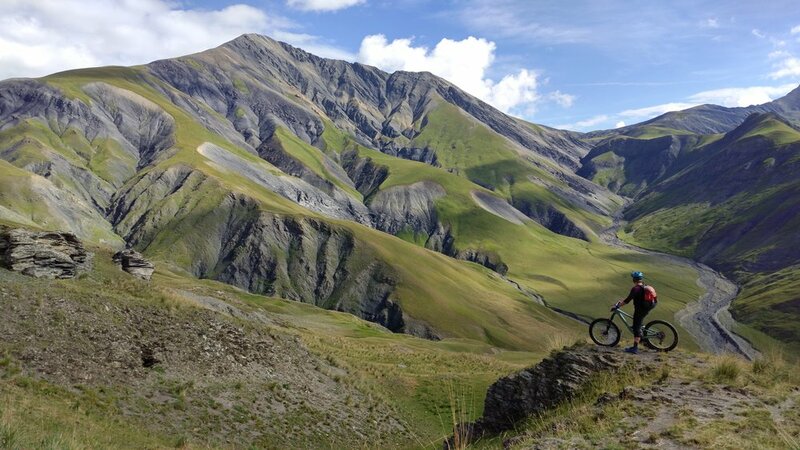 Epic views, mind-blowing flowy Alpine singletrack, quiet unspoilt trails, and a truly incredible adventure exploring the hidden gems of this amazing part of the Alps! The Hautes-Alpes are a mountain bikers paradise. The stuff dreams are made of. Endless fast-flowing singletrack through wild landscapes. Spectacular glaciers, majestic towering rocky peaks and deep unspoiled valleys, mountain pastures and vast forests, riddled with a huge concentration of the finest quality natural trails. Add to this the fact that the area receives over 300 days of sunshine a year on average and it’s our idea of mountain biker heaven! Situated between Provence and the Alpes du Nord, this region is the highest mountainous Department in France, and an incredible destination for year-round outdoor activities, yet it is still relatively quiet compared to the busy resorts of the Savoie and Haute-Savoie further North. We’ve been visiting the area for the last 20 years, initially for mountaineering and backcountry ski trips, but over the last decade, our interest has shifted to mountain biking and the potential in this area. Exploratory trips and journeys through these mountains have allowed us to explore more and more of the fantastic trails here, as well as touching on this area whilst guiding for other companies over the last few years. It’s certainly our favourite part of the the whole of the French Alps to ride in, and we’ve visited a lot of places! We’re excited to announce we’ll be running our first overseas trips here in July 2019, and cannot wait to share this spectacular area with our guests. We've put together a 6 day trip, on which we'll sample a little taste of a few of the best areas within this region. A Safari tour if you like, combining what we think is the best way to experience the riding here. We’ve aimed to include as much as we can to make a complete holiday package, so that once you arrive you can leave the logistics, guiding, and organisation to us and simply enjoy your holiday and 6 days of great riding! You'll be guided by Julia, an experienced and highly qualified guide who has spent over 7 years guiding and riding all over the Alps, and is one of a small number of British mountain bike guides to hold a French Carte Professionnelle, allowing her the full and legal right to guide in France. We use a professional driver to help us, who has experience in mountain shuttling on these kind of trips, and clean comfortable VW transporter minibuses fully equipped with seatbelts as well as a specific bike trailer. Included in the price of the trip is pick-up and drop-off at Geneva airport. In order to take advantage of this you will need to ensure you book flights which arrive no later than 14:00 on the Saturday you arrive, and leave no earlier than 14:00 on the Saturday you leave. On the Saturday you arrive, you’ll be met at an agreed point and time (communicated to you via email after booking) by our driver and van, ready for the drive to the first hotel. There is no need to assemble your bikes, please leave them in their bike bags and we can do this at the hotel with a beer in hand! The transfer takes about 3 hours. Unfortunately the airports closest to our destination are relatively small and do not have many flight options during the Summer months. Arranging collection from Geneva means most people will be able to find flights easily, wherever they are flying from. We stay in the same hotel on the first and last nights of our trip, and we have arranged for all bike bags/boxes to be stored securely there for the week. This also means that should you wish to drive here, there is parking in the village where you can leave your vehicle for the week. On the Saturday of your departure, we will make aim to be dropping you off at Geneva airport by 12:00, hence the reason for not booking a flight any earlier than 14:00. We stay at 4 different hotels during the week, all chosen for their spectacular locations, friendly hospitality, and quality of accommodation, service and food (and their proximity to awesome riding!). Our first hotel is where we spend the most time, 3 nights at the start of the week, and the last night. We’ve been staying here for many years now, and love the friendly welcome we always receive from the owners, as well as the amazing food and great wine and gin menu! Our other hotels are all equally as fantastic, a couple of them have hot-tub/pool facilities, and we’ve tested the food and room comfort at all of them to ensure they meet our high standard of requirements. Each hotel has secure bike storage, and most have bike-washing facilities, should we need them. Breakfasts at all the hotels are a buffet style and will include plenty of fresh breads, pastries, cereals, fruit, yoghurt, cheeses, meats, often eggs, juices and tea/coffee. Dinners are 3-courses, and are either a set-menu, or sometimes a choice of a few dishes. Everywhere we are staying knows we will need biker-sized portions! All the hotels can cater for most dietary requirements, but please let us know these at the time of booking so we can let them know in advance. We will provide packed lunches each day, including a large baguette-style sandwich with differing fillings, fruit, crisps, bars, and trail snacks. Sometimes we will pack these in the morning and take them with us, other days we’ll be able to meet the van after a trail or before a shuttle and can collect and eat them there. where will we be riding? The Hautes-Alpes is vast, and with only a week we cannot explore every corner of it, so we’ve focused on a corridor of the area we like best. We’ll begin in La Grave, a small town best known for it’s legendary big-mountain skiing terrain. From here we have access to an iconic lift which takes us up to 3600m! Several incredible high alpine descents of up to 2000m are possible from here. The sunny south-facing side of the same valley also contains some fantastic varied singletrack riding through stunning scenery, with a relatively small amount of effort to get there, and we’ll spend a day exploring the options around here. Moving South-East, we have a day of riding in the delightful Serre-Chevalier valley, working our way towards Briancon. Beautiful balcony trails, fast-flowy singletrack, switchbacking trails through steep wooded hillsides, and some loose, rocky, technical trails mean this day has a bit of everything, all mostly achieved by shuttling with minimal climbing! From here we’ll start to enter the Queyras regional natural park, where we’ll be spending the second half of the week. Covering an area of 65,000 hectares, this incredible mountain playground is full of beautiful flora and fauna, unspoilt scenery, and trails that will leave you grinning from ear-to-ear. There'll be days where we shuttle up to high cols to descend grin-inducing epic long trails to the valley, and others where we head out for backcountry days to access places and trails we can only reach under our own steam. How fit/experienced do i need to be? During the trip we travel through some fairly remote areas and encounter a full variety of riding, not all, but some of it technical, steep and committing. You should be an advanced and very experienced rider, used to riding natural mountainous trails with confidence. You should ideally have had some previous experience of riding technical singletrack in the Alps, or at least high mountain trails in Scotland or the Lake District. A good quality modern Enduro style bike (ie something with 5"/130mm+ of travel), tyres of at least 2.3"+ and knee pads are required for this trip. A very good level of endurance fitness is essential for you to enjoy this trip. We will be moving at a steady pace for up to 8 hours some days, and descents are long and physically tiring. We will climb between 400 and 1200m each day, trying to alternate tougher days with relatively easier ones. Some of this climbing will involve pushing and carrying your bike so you should be prepared and fit enough for this. There are 6 days of guided riding, so no day off, on this trip, but obviously you are always welcome to join the driver in the van should you need a rest. If you are interested in joining the trip but unsure about your fitness or experience level, please contact us to discuss before booking. Booking an expensive holiday such as the one we are offering can often come with many questions beforehand. Your safety and enjoyment are our ultimate priorities, and as such, you can rest assured that we are a professional operation, holding comprehensive Tour Operator Liability Insurance, as well as using a Serenity Travel Trust account to ensure our clients’ money is protected in the event of our financial failure, and to comply with the UK Government Package Tour Regulations Act. All guides are qualified, experienced, first-aid trained, insured, and fully licensed to guide in France, and our vehicle and driver are part of a professional transfer company operating in France. We are happy to answer any further questions you might have on the trip, and you can also find a section on overseas holidays on our FAQs page. The best way to contact us for any other questions is via the form on our contact page. Bookings are being taken now and are limited to 7 people per trip. Please contact us via clicking on the button below (which will link to our contact page), indicating which date you are interested in, and we will send you our booking form, terms and conditions, and deposit details.